Mr. Tervo received his BS degree in Mechanical Engineering from the University of Wisconsin-Madison in 2012. After graduating, he worked at Southwest Research Institute in the field of fluid dynamics research and testing. 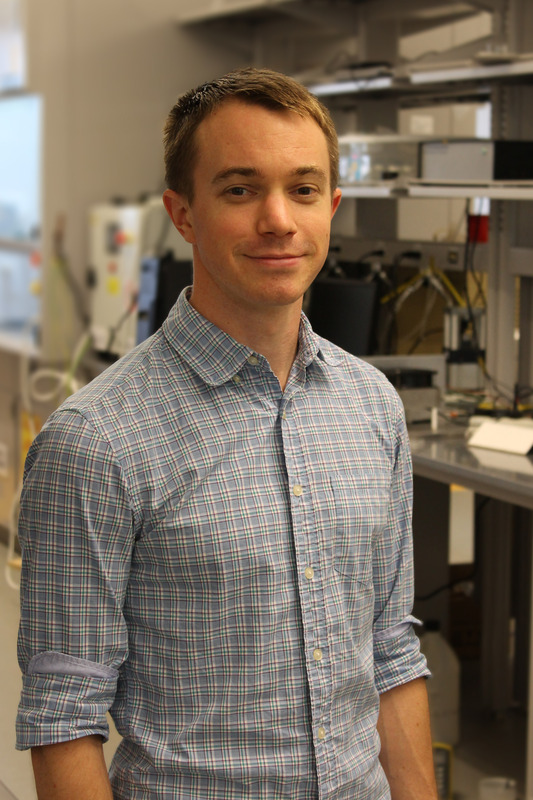 Mr. Tervo began his PhD studies at Georgia Tech and joined the NEST lab in 2014, and he also joined the Nanoscale Thermal Radiation Laboratory in 2016. In 2015, he received the prestigious National Science Foundation Graduate Research Fellowship. His research focuses on light/matter interactions in nanostructures for enhanced heat transfer, sub-diffractional waveguiding, and energy conversion applications. Mr. Tervo has experience with high performance computing, experimental design and control, solution chemistry processing, and materials characterization including FTIR spectroscopy, Raman spectroscopy, SEM, DSC, TGA, and other techniques. 11/2018: Eric presented his work on “Dipolar Radiative Thermal Conductivity in Nanoparticle Arrays” at ASME IMECE in Pittsburgh, PA.
9/2018: Eric presented his Ph.D. proposal on “Thermal Radiative Energy Transfer in Polaritonic Nanostructure Arrays” at Georgia Tech. 7/2018: Eric published his paper “An economic analysis of residential photovoltaic systems with lithium ion battery storage in the United States” in Renewable and Sustainable Energy Reviews (link). Special thanks to co-authors Kenechi Agbim, Freddy DeAngelis, Jeffrey Hernandez, Hye-Kyung Kim, and Adewale Odukomaiya. 3/2018: Eric published his paper “Sub-diffractional waveguiding by mid-infrared plasmonic resonators in semiconductor nanowires” in Nanoscale (link). Special thanks to our collaborators Dmitriy Boyuk and Prof. Michael Filler from Chemical and Biomolecular Engineering at Georgia Tech. 3/2018: Eric published his paper “Near-field radiative thermoelectric energy converters: a review” in Frontiers in Energy (link). 7/2017: Eric presented work by a an interdisciplinary group of graduate students on “An Economic Analysis of Residential Photovoltaic Systems with Battery Storage in the United States” at a symposium in Atlanta. 6/2017: Eric published his paper “Collective near-field thermal emission from polaritonic nanoparticle arrays” in Physical Review Materials (link). 2/2017: Eric was selected to participate the 2017 ARPA-E Energy Innovation Summit Student Program. 11/2016: Eric presented his work on “Heat Transfer by Propagating Surface Polaritons in Nanoparticle Chains” at ASME IMECE in Phoenix, AZ. 5/2016: Eric published his paper “High thermal conductivity in polaritonic SiO2 nanoparticle beds” in Materials Horizons (link). This work was featured on technical news sites such as phys.org and was highlighted as an editor’s choice in Science. Special thanks to our collaborators Olalekan Adewuyi and Prof. James Hammonds, Jr. from Howard University. 4/2015: Eric was awarded the prestigious NSF Graduate Research Fellowship (DGE-1650044). 9/2014: Eric was awarded a fellowship through the NSF Integrative Graduate Education and Research Traineeship program on Nanomaterials for Energy Storage & Conversion (DGE-1069138).